Well the first step to securing it’s first Emmy nomination has been achieved. 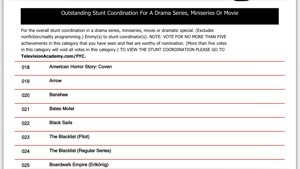 Arrow does appear on the ballot for Outstanding Stunt Co-ordination in a Drama Series, miniseries or Movie, alongside 39 other entries like The Tomorrow People. Hopefully the Emmy voters will recognise the talent and originality on the Canadian filmed show. Good luck James, JJ & the Arrow team. I believe the submission is under JJ’s name. This week fans united to support the Arrow stunt team in a bid to trend “Arrow Stunts Deserve An Emmy”. I gave up counting but there were over a thousand tweets. James and JJ joined the trend party RTing some of the kind words followers shared. Stay tuned as we give it another go soon. Next Happy Father’s Day Bam!